TORONTO, ONTARIO, November 21, 2017 – Get where you’re going – every time – in style and comfort with the Toyota Tundra full-size pickup truck. Rugged and powerful, yet also surprisingly refined, the Tundra line-up welcomes two new trucks for 2018 – the Tundra TRD Sport models in Double Cab and CrewMax cab configurations. In addition, 2018 Tundra pickups receive updated design cues, additional safety technologies including Toyota Safety Sense P, upgraded convenience technologies, and more. The 2018 Tundra expresses power and capability through a bold, chiseled exterior design. For 2018, all models feature a new grille and headlight design, plus LED daytime running lights. These join popular Tundra features such as the easy lower and lift, locking tailgate that’s also easy to remove, and large door handles that are easy to use even while wearing thick work gloves. As with previous years, the 2018 Tundra is available in a variety of body combinations – including Double Cabs with 6.5-foot or 8.1-foot beds and CrewMax cabs with a 5.5-foot bed – making it easy for Canadians to pick the pickup truck that’s right for them. Inside, comfort and space abound. Double Cab models have space for five or six adults (depending on model), while CrewMax cab models feature an expansive cabin with seating for five. All models feature a 60/40 split rear seat that may be operated with one hand to provide floor-to-ceiling storage behind the front seats. Double Cab models add an under-seat tray for additional, concealed storage space. The driver will enjoy the comfortable seating and well-placed instruments and controls, including – new for this year – a 4.2” multi-information display as standard equipment on all models. Other standard features on all models include cruise control, air conditioning, power door locks, a Display Audio system with Bluetooth connectivity, voice recognition and steering wheel-mounted audio controls, a tachometer and trip computer, sliding sun visors, 12v accessory power outlet for personal electronics, coat hooks, a locking glove box, all season floor mats, and more. Pickups are synonymous with power, and the 2018 Toyota Tundra delivers plenty, with a choice of two engine sizes. Most models are equipped with a 381 peak horsepower 5.7L i-FORCE V8 that generates up to 401 lb-ft of torque. Towing capacity ranges from 4,345-4,535 kg (9,579-10,000 lb) depending on model. Toyota also offers a Tundra fitted with a highly efficient, 310-peak horsepower 4.6L i-FORCE V8 that delivers up to 327 lb-ft of torque and a 2,945 kg (6,493 lb) towing rating. Both engines feature sequential multiport electronic fuel injection, an electronic throttle control system with intelligence, crank hold starting control and stainless steel exhaust systems. These engines are mated to a six-speed sequential shift automatic Super ECT transmission with overdrive. Transmissions on models with 5.7L engines feature tow/haul mode, a lockup torque converter, transmission cooler, and automatic transmission fluid warmer. Tundra models with the 5.7L engine also feature a trailer brake controller and trailer sway control, as well as Toyota’s Tow Package including a heavy duty tow hitch receiver, 4+7 pin connectors, supplemental transmission cooler, and transmission fluid temperature gauge. 4x4 models feature Toyota’s on-demand, one-touch 4WD system with auto limited slip rear differential. The Toyota Tundra also delivers impressive safety performance, through a long list of active and passive safety systems. 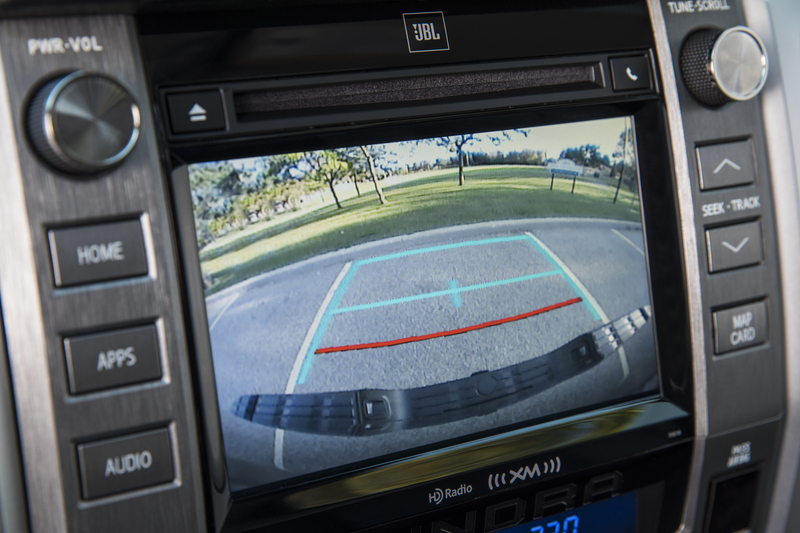 New for 2018, all models are standard-equipped with Toyota Safety Sense P. This bundle of active safety technologies – including the Pre-Collision System with Pedestrian Detection, Lane Departure Alert, Automatic High Beams, and full speed Dynamic Radar Cruise Control – enhances driver capabilities to mitigate collisions, stay in lane, and see at night. Other safety technologies standard on all 2018 Tundra models include the Toyota Star Safety System, eight air bags and a back-up camera. The 2018 Toyota Tundra 4x2 Double Cab SR5 Plus 5.7L (starting MSRP: $42,190) features eight-way power adjustable driver’s seat, heated front seats, power windows with driver’s side auto up/down, keyless entry, 18” alloy wheels, 8.1-foot cargo bed, bed rail system and tie-down cleats, manual headlamp levelling system, fog lamps, and more. The 2018 Toyota Tundra 4x4 Double Cab SR5 4.6L (starting MSRP: $39,590) features black dash trim, interior door handles and exterior mirrors, 18” styled steel wheels, a 6.5-foot cargo bed, manual headlamp levelling system, brake control connector, and more. This model may be enhanced with the SR5 Plus Package (starting MSRP: $43,890), which adds power windows with driver’s side auto down, keyless entry, chrome trim and accents, foot well lighting, an upgraded audio system with 7” Display Audio screen, 18” alloy wheels, heated front seats, eight-way power adjustable driver’s seat, bed rail system and tie-down cleats, fog lamps, and more. The TRD Offroad Package (starting MSRP: $49,690) adds fuel tank protector plates, Bilstein shocks, all-terrain tires on 18” offroad alloy wheels, power sliding rear window, garage door opener, clearance and back-up sensors, anti-theft system, navigation, LED headlamps and fog lights, TRD detailing, and more. New for 2018, the TRD Sport Package (starting MSRP: $51,190) adds TRD Sport-tuned Bilstein shocks, a sport-tuned suspension with TRD front and rear sway bars, 20” alloy wheels, power sliding rear window, navigation system, garage door opener, clearance and back-up sensors, hood scoop, anti-theft system, LED headlamps and fog lamps, TRD detailing, and more. The 2018 Toyota Tundra 4x4 Double Cab SR5 Plus Long Bed 5.7L (starting MSRP: $46,390) features a 7” Display Audio system, eight-way power adjustable driver’s seat, heated front seats, power windows with driver’s side auto down, silver and chrome interior trim and accents, foot well lighting, keyless entry, 18” alloy wheels, chrome grille surround, Tow Package, 8.1-foot cargo bed, bed rail system and tie-down cleats, manual headlamp levelling system, and more. The 2018 Toyota Tundra 4x4 Double Cab Limited 5.7L (starting MSRP: $55,690) features a 7” Display Audio system with navigation, dual zone automatic climate control, eight-way power adjustable driver’s seat, 4-way power adjustable front passenger’s seat, leather seat surfaces, heated front seats, a compass, power windows with driver and front passenger auto up/down, power sliding rear cab window, wood-grain and soft-touch dash trim, soft-touch door trim, leather-wrapped steering wheel, garage door opener, clearance and back-up sensors, the Blind Spot Monitor and Rear Cross Traffic Alert safety systems, anti-theft system with glass break sensor, keyless entry, 20” alloy wheels, billet style front grille, Tow Package, 6.5-foot cargo bed with spray-in bedliner, bed rail system and tie-down cleats, automatic headlamp system, manual headlamp levelling system, and more. The TRD Offroad Package (starting MSRP: $52,190) adds fuel tank protector plates, Bilstein shocks, all-terrain tires on 18” offroad alloy wheels, power sliding rear window, garage door opener, clearance and back-up sensors, anti-theft system, navigation, LED headlamps and fog lights, TRD detailing, and more. New for 2018, the TRD Sport Package (starting MSRP: $53,690) adds TRD Sport-tuned Bilstein shocks, a sport-tuned suspension with TRD front and rear sway bars, 20” alloy wheels, power sliding rear window, navigation system, garage door opener, clearance and back-up sensors, hood scoop, anti-theft system, LED headlamps and fog lamps, TRD detailing, and more. The 2018 Toyota Tundra 4x4 CrewMax Limited 5.7L (starting MSRP: $57,590) features a 7” Display Audio system with AVN premium navigation, dual zone automatic climate control, eight-way power adjustable driver’s seat, 4-way power adjustable front passenger’s seat, leather seat surfaces, heated front seats, a compass, power windows with driver and front passenger auto up/down, power vertical sliding rear cab window with defroster, wood-grain and soft-touch dash trim, soft-touch door trim, leather-wrapped steering wheel, garage door opener, clearance and back-up sensors, the Blind Spot Monitor and Rear Cross Traffic Alert safety systems, anti-theft system with glass break sensor, keyless entry, 20” alloy wheels, a power moon roof, billet style front grille, Tow Package, 5.5-foot cargo bed with spray-in bedliner, bed rail system and tie-down cleats, automatic headlamp system, manual headlamp levelling system, and more. The 2018 Tundra 4x4 CrewMax Platinum 5.7L (starting MSRP: $60,390) features a JBL audio system with 7” Display Audio, AVN premium navigation, dual zone automatic climate control, 10-way power adjustable driver’s seat with memory system, 4-way power adjustable front passenger’s seat, premium leather seat surfaces, heated and ventilated front seats, a compass, power windows with driver and front passenger auto up/down, power vertical sliding rear cab window with defroster, leather dash trim, soft-touch door trim, leather-wrapped steering wheel, garage door opener, clearance and back-up sensors, the Blind Spot Monitor and Rear Cross Traffic Alert safety systems, anti-theft system with glass break sensor, keyless entry, 20” premium alloy wheels, power adjustable and folding memory mirrors with integrated signal and puddle lamps, a power moon roof, billet style front grille, Tow Package, 5.5-foot cargo bed with spray-in bedliner, bed rail system and tie-down cleats, automatic headlamp system, manual headlamp levelling system, and more. This model may also be ordered as The 1794 Edition (starting MSRP: $60,890) featuring a wood-grain and leather-wrapped steering wheel and shift knob, premium leather seating with suede accents, chrome grille surround and other detailing, unique 1794 Edition badging, and more. The 2018 Toyota Tundra is now on sale at Toyota Dealers across Canada. For complete and up to date details and specifications, visit www.toyota.ca/tundra.